Background: Increase in neurologic diseases burden has increased the demand for neurology services globally, despite the shortcomings of shortage and maldistribution of neurologists worldwide, including Sub-Saharan Africa. This has placed significant pressure on the few available neurologists to provide optimal and effective services in our resource-challenged settings. Methods: Neurology referrals were prospectively reviewed over a period of 3 months. Sociodemographic characteristics of the patients, the initial diagnosis by the requesting team, the reasons for the consult/referral, the requesting personnel, duration of hospital stay before request, the time interval between receiving the request and review, the working and final diagnosis after the review, and the diagnostic outcome of neurologic review were analyzed using Predictive Analytics Software® version 18.0.0 for Windows (Chicago, Illinois, USA). Results: Fifty-three hand written in-patient requests were reviewed over the period of study given an average rate of 4.4/week. 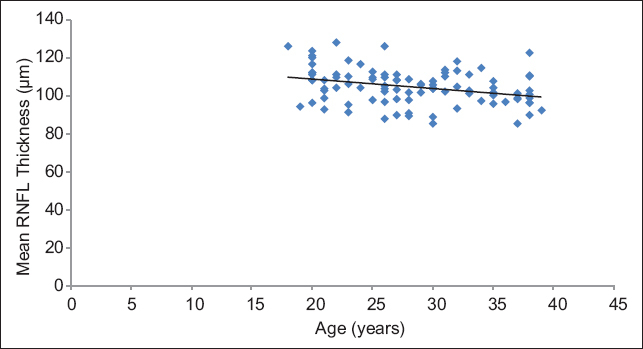 The mean age was 50.8 ± 16.1 years, and the median length of stay before a review was 1 day (interquartile range: 1–2.5 days). Diagnostic outcome of the reviews were; new diagnoses in 4 (11.3%), the incorrect diagnosis changed in 8 (15.1%), contribution to the differential diagnosis in 15 (28.3%), and contribution to management plans in 24 (45.3%) patients. The association between diagnostic outcomes and mortality in our study was not statistically significant (χ2 = 6.66, P = 0.08). Conclusion: Our study showed that in-patient neurologic reviews led to significant improvement in diagnostic and management plans. Appropriate policy guidelines should focus more on efficient ways of maximizing benefits of these reviews to patients without overburdening the few available neurologists in our environment. Objective: To assess retinal nerve fiber layer (RNFL) thickness measurements of normal Northern Nigerian adults using optical coherence tomography (OCT). Subjects and Methods: The OCT procedure was carried out with the Carl Zeiss Stratus OCT Model 3000 software version 4.0 (Carl Zeiss Meditec AG, Jena, Germany). The fast RNFL scan protocol was used to obtain RNFL thickness measurements. Student's t-test was used to compare mean RNFL thickness values. P ≤ 0.05 was considered as statistically significant. Average RNFL thickness was correlated with age. Results: Two hundred and twenty eyes of 110 subjects aged 18–51 years were examined. The average RNFL thickness was 104.17 ± 10.71 μm. The mean values for the RNFL thickness were 129.15 ± 16.87 μm, 135.34 ± 20.40 μm, 85.10 ± 23.60 μm, and 67.19 ± 13.27 μm for the inferior, superior, nasal, and temporal quadrants, respectively. A statistically significant difference was found between males and females for the mean RNFL thickness (t = 3.30, P = 0.001) and for the mean superior and inferior RNFL thickness. There was a statistically significant difference between right and left eyes (t = 3.73, P = 0.001) for the mean RNFL thickness. A negative correlation was found between RNFL thickness and age (r = −0.313, P = 0.002). Conclusion: Normal RNFL thickness measurements in healthy Nigerian adults are presented. The RNFL was found to be thicker in females and in right eyes. The values were comparable to those of the Indian population but higher than some Caucasian values. Background: Grand multiparity is known to be associated with pregnancy complications. Nigeria with a contraceptive prevalence of <15% and culture of early marriage in the northern part of the country, many women get to grand multiparity early in their obstetric carriers. These women contribute significantly to the bad obstetric performance indices in the country. The present study was to explore the contraceptive choices among grand multiparous women. Methods: This study was a descriptive cross-sectional study among grand multiparous women attending an antenatal clinic. Data were collected on sociodemographic characteristics, contraceptive choices, and factors that influence such choices. The data were analyzed using Statistical Package for the Social Sciences version 18. Results: There were 219 respondents. The mean age was 33.05 ± 3.17, and the mean parity was 6.48 ± 1.83. Most of the respondents (208, 95.50%) were aware of modern contraceptive methods, and oral contraceptive was the method of most of the respondents (197, 90.00%). Only 92 (42.00%) were currently using a modern contraceptive method. Being convenient for the lifestyle was the reason for the choice of a contraceptive method by many of the respondents (42, 19.10%). Conclusion: There was high awareness of modern contraceptive methods; however, there was low use prevalence among respondents, and the desire for more pregnancy was the reason for the nonuse. Background/Objective: Renal diseases constitute an enormous health burden globally, more so in developing countries. This report determines the patterns and outcomes of renal diseases in the medical wards of the University Teaching Hospital in Nigeria. Methods: A retrospective study of patients admitted for renal disease in 4 years. Results: A total of 3841 patients were admitted to the medical wards, of which 590 (15.4%) had renal disease. 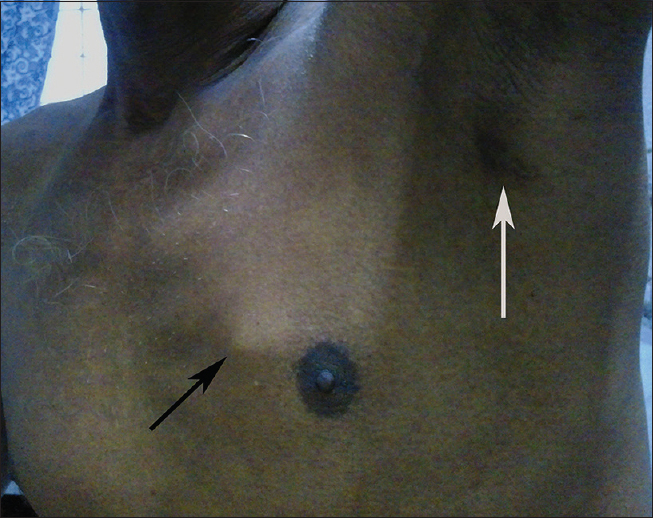 Mean age of patients was 46 ± 15 years. 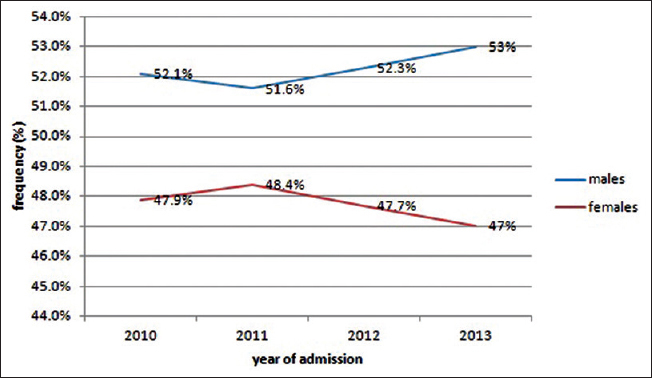 Median duration of admission was 14 days (range 1–92 days). The most prevalent renal diseases were hypertensive nephropathy, diabetic nephropathy, chronic glomerulonephritis, and HIV-related renal disease constituting 22.8%, 16.6%, 14.4%, and 13.1%, respectively. Acute kidney injury constituted 12.4% of renal admissions. Analysis of outcome showed that 317 (53.7%) were discharged home, 49 (8.3%) patients discharged themselves against medical advice or absconded while 120 (20.3%) patients died of the disease. The highest mortality rate (22.5%) was observed among patients with the HIV-related renal disease. 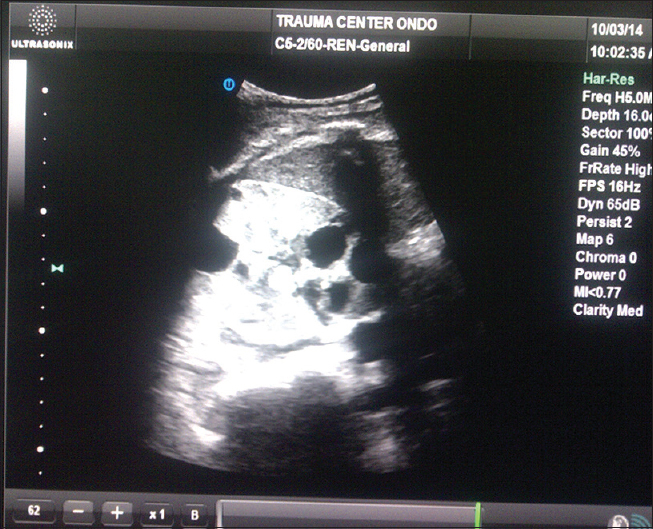 Conclusion: Renal disease remains a significant cause of morbidity and mortality in Port Harcourt, Southern Nigeria. This underscores an urgent need to institute measures for prevention and early detection of renal disease and reduction of its burden. Background: Incidence of intracerebral hemorrhage (ICH) is twice as high as in Western countries. Prognostic factors for predicting function outcome and mortality play a major role in determining the treatment outcome. Methods: A prospective study of male and female patients ≥12 years with primary nontraumatic intracranial hemorrhage were included. Hemorrhage caused by trauma, anticoagulant or thrombolytic drugs, brain tumor, saccular arterial aneurysm or vascular malformation were excluded. Functional outcome of patients was determined by modified Rankin's scale. Glasgow Coma Scale (GCS) score and ICH score were calculated for each patient. Results: Hypertension was present in 45 out of 49 patients (92%) with ICH of basal ganglia. Hypertension was significantly associated with worst clinical outcome. Mortality was high if the patient was comatose/stuporous compared to drowsy state (P < 0.0001). Mortality was found to be high when the size exceeded 30 cm3. High ICH score, low GCS score at the time of admission, presence of intraventricular hemorrhage, and midline shift were significantly associated with poor clinical outcome. Conclusions: Intracranial hemorrhage can be deleterious if present with low GCS score, high ICH score, intraventricular extension, and midline shift. Background: Presence of comorbidity in surgical patients may be associated with adverse perioperative events and increased the risk of morbidity and mortality. This audit was conducted to determine the frequencies of comorbidities in elective surgical patients and the outcome of anesthesia in a Tertiary Hospital in Nigeria. Materials and Methods: Observational study of a cross-section of adult patients scheduled for elective surgery over a 6-month period. A standardized questionnaire was used to document patients' demographics, the presence of comorbidity and type, surgical diagnosis, anesthetic technique, intraoperative adverse events, and outcome of anesthesia. The questionnaire was administered pre- and post-operatively to determine the effects of the comorbidities on the outcome of anesthesia. Results: One hundred and sixty-five adult patients aged between 18 and 84 years were studied. There were 89 (53.9%) females and 76 (46.1%) males. Forty-five (27.3%) have at least one comorbidity. Hypertension was the most common (48.8%) associated illness. Other comorbidities identified include anemia (17.8%), asthma (8.9%), diabetes mellitus (6.7%), chronic renal disease (6.7%), and others. The perioperative period was uneventful in majority of patients (80.6%) despite the presence of comorbidities. Intraoperative adverse events include hypotension, hypertension, shivering, and vomiting. No mortality was reported. Conclusion: Hypertension was the most common comorbidity in this cohort of patients. The presence of comorbidity did not significantly affect the outcome of anesthesia in elective surgical patients. A little over 30 cases on co-existing nephrotic syndrome and autosomal dominant polycystic kidney disease (ADPKD) have been reported from different regions of the world since 1957. We present a case report on co-existence of nephrotic syndrome (secondary to lupus nephritis) with ADPKD in a 24-year-old woman from Nigeria. She was positive for anti-double stranded DNA. Renal histology showed International Society of Nephrology/Renal Pathology Society Class II lupus nephritis. 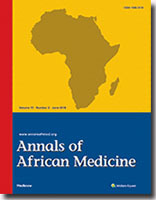 The co-existence of nephrotic syndrome and ADPKD may have been overlooked in Africa in the past. There is a need to screen for nephrotic syndrome in patients with ADPKD among clinicians in the African setting. Spinocerebellar ataxia type-7 (SCA7) is a cytosine-adenine-guanine (CAG) repeat polyglutamine disorder characterized by progressive degeneration of the cerebellum, brainstem, spinal cord, and retina. Clinical features include progressive ataxia, visual loss, pyramidal weakness, sensory impairment, and dementia. 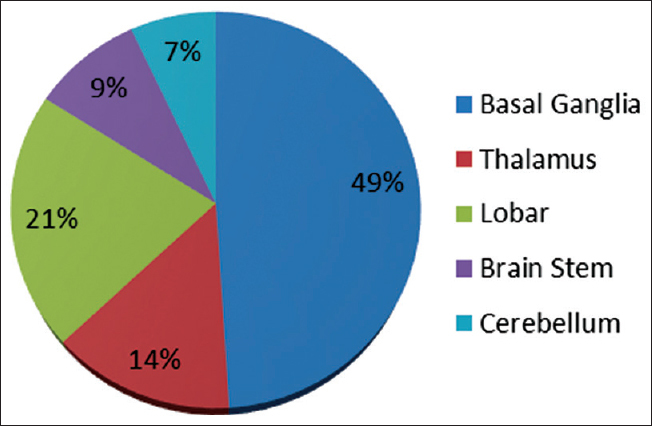 Among the autosomal dominant cerebellar ataxias, SCA7 is relatively common in Scandinavia and South Africa but rare worldwide and is not previously reported in Nigeria. 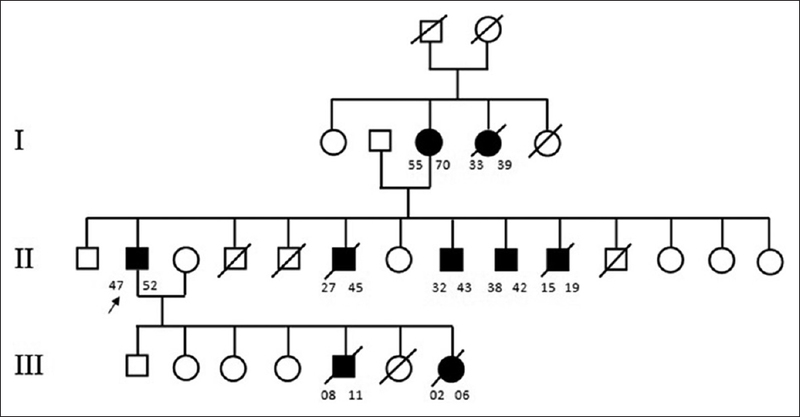 In this study, we describe a family in Katsina State, Northwest Nigeria, with nine individuals across three generations affected by the SCA7 phenotype. Analysis of DNA from proband and two affected relatives revealed 39 CAG repeat expansions in one allele of ataxin-7 in each.